Look. I’m not here to blow your minds any more than the legal necessity. And as for your hearts, I’m not here to expand them beyond the legal limit. I’m not monster, only a critter of questionable cleanliness and a fine coat of silver fur. You know, not unlike the incredible opossum. Why do I bring the opossum into your eyes and mind? 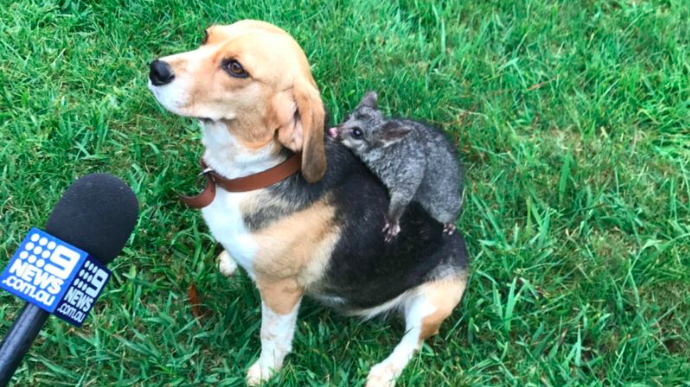 Why, only to introduce to you one of the most incredible tales that the internet, in its ever increasing scope and imagination, has ever witnessed: the story of the beagle who, after losing her children, formed an unlikely and beautiful bond with a baby possum. There are even photos just so you can truly believe that the idea of good and the idea of love can be shared between species, unlikely duos, generations, and forever beating hearts. Check out a photo of the two animals below. Adorable! And while the possum sleeps at night, it being a nocturnal animal and all, Molly stands guard and makes sure the little guy is kept safe. “Molly just sits under the tree where she’s sleeping and just waits for her,”, said Elle. Look. It’s a cute story. And I am sure your heart is now filled with helium and flying into the air like a damn Valentine’s Day balloon from all the expansion. What do you think of the adorable story? Let us know in the comments or on Twitter at @WhatsTrending.